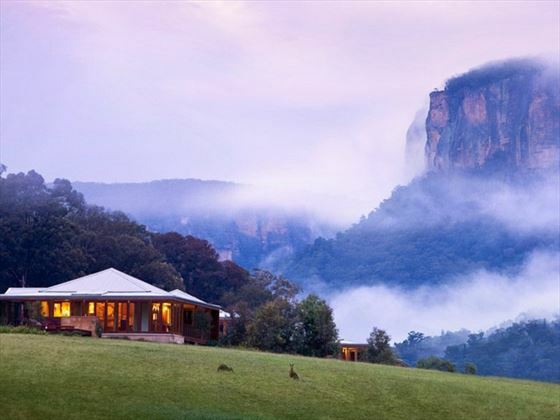 The resort is situated its own 7,000 acre conservancy.Sanctuaries of privacy with stunning views of the Wolgan Valley landscape, each of the free-standing villas features a private pool and veranda. 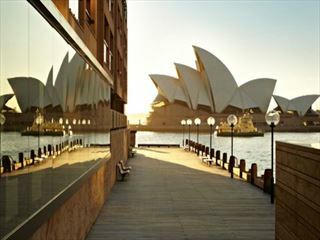 An extraordinary resort in an extraordinary location. 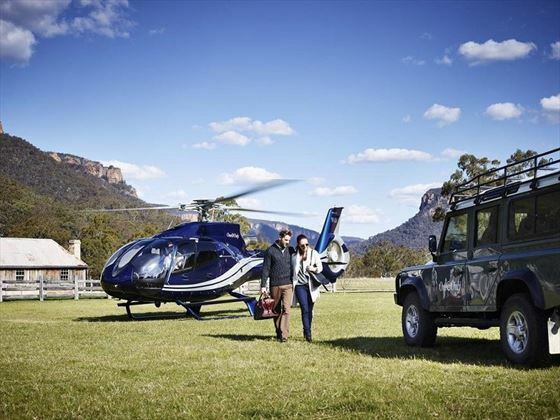 Located on Australia's Great Dividing Range between the Wollemi National Park and the Gardens of Stone National Park, within the World Heritage-listed Greater Blue Mountains. 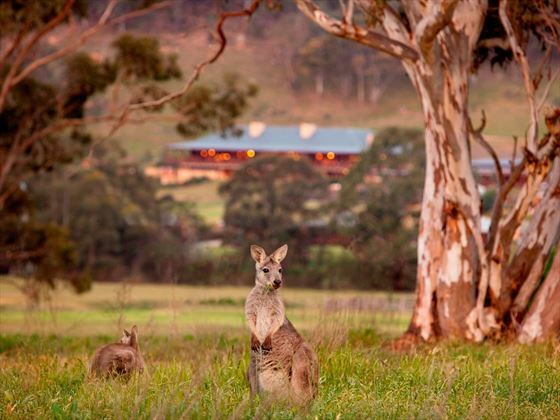 The resort occupies just one percent of its own 7,000 acre conservancy and combines absolute luxury with a quintessentially Australian bush experience. The Wolgan Valley is approximately 26 kilometres long and seven kilometres wide. The Wolgan River cuts a deep gorge through the sandstone in part of the valley, forming a bottleneck that is only one kilometre wide. Steep cliffs contrast with the gentle curve of the valley floor and a picturesque road winds along the river to reach the resort on the eastern end. Constructed from wood and stone typifying the Federation period, the 36 free-standing Heritage Villas are ideal for single guests or couples looking for a relaxing retreat or romantic getaway. 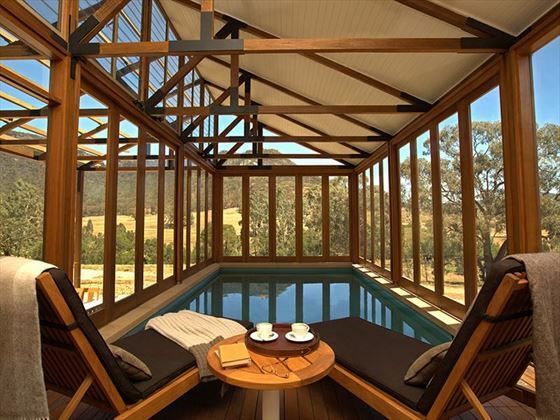 Each offers exceptional privacy and breathtaking Wolgan Valley views, as well as a private pool with its own deck and concertina doors, making it perfect for year-round use. Inside, a central, double-sided fireplace made of local sandstone separates the bedroom from the living area. Warm, earthy tones and neutral linens are complemented by wood furniture crafted by local artisans, offering a unique sense of style and place. A luxurious bathroom features twin vanities, separate shower with skylight and bath with views to the valley. An ideal family retreat or the perfect hideaway, each of the Two-Bedroom Wollemi Villas features a large living room with separate lounge and dining areas, double-sided fireplace, two spacious bedrooms and a private, temperature-controlled swimming pool.With extensive views of the Greater Blue Mountains, each villa takes full advantage of the expansive backdrop of imposing escarpments. The villas have been thoughtfully designed to provide space to gather with family and friends, or indulge in a peaceful retreat to relax with a good book. The main bedroom features a King-size bed whilst the second bedroom can accommodate either a King bed or two King singles. Whether planning a romantic night in, enjoying a family meal, watching a film from the resort's extensive collection, relaxing on the veranda or enjoying a dip in the pool, Wollemi Villas are the perfect accommodation choice to make the most of this stunning Greater Blue Mountains setting. 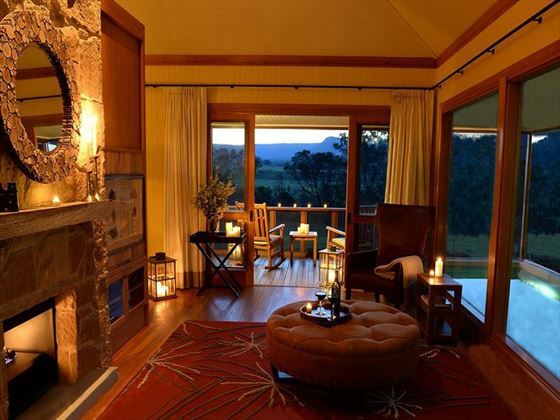 Nestled in a private corner of the resort with panoramic views of Wolgan Valley and the Greater Blue Mountains, this expansive villa serves as a completely self-contained lodge. Featuring a beautifully landscaped garden with private terraces and swimming pool, it is the ideal choice for a family vacation or getaway with friends. The generous living and dining room with double-sided fireplace, as well as a fully equipped gourmet kitchen, make entertaining with family and friends a pleasure, whilst a private butler service is available to anticipate and accommodate every need and wish. Two spacious bedrooms each with their own bathroom, and a third guest room that easily doubles as private staff quarters, ensure a level of luxury and privacy unlike any other. 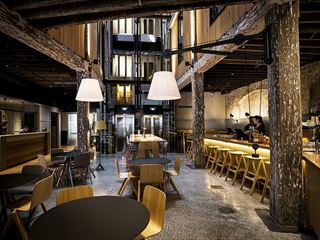 An elegantly refined venue with lofty, timber-beamed ceilings and sandstone walls. 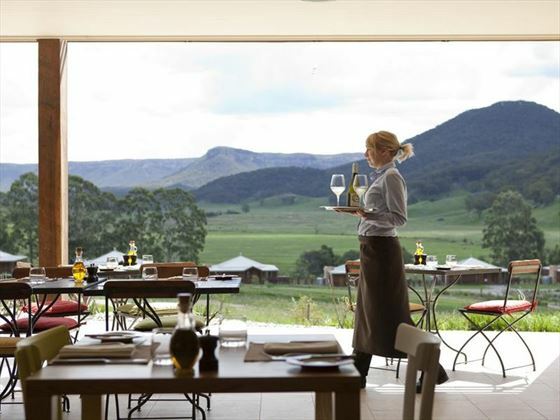 Menus change daily according to season and highlight local food heroes including Mandagery Creek Venison, Oberon line trout, local organic cheese from Jannei Goat Cheese Dairy and olive oil from Rylstone. Located in the Main Homestead, begin the day with a leisurely breakfast of freshly baked pastries, organic muesli, fruit compôtes, local jams and honey and freshly baked breads followed by a choice hearty cooked dishes prepared by the resort's chef, or a presentation of local meats and cheeses.In the evening, watch as a setting sun drenches the surrounding landscape in soft colours, offering a romantic backdrop for a delectable six-course menu or à la carte dinner. Located in the Main Homestead, the casual-yet-refined Country Kitchen is an ideal choice for lunch or an afternoon snack offering a fresh selection of tantalising artisanal breads and hand-roasted coffees. Look to the Seasonal Blackboard for daily culinary inspirations, or savour an incredible selection of authentic dishes such as Salted White Bait Fritters served with Crispy Salad, or Butternut Pumpkin with Black Cod Tortellini. During the summer months, the surrounding landscape is the perfect setting for a gourmet picnic filled with fresh farmhouse-style breads, antipasto, mouth-watering cheese platters or fresh made salads and sandwiches. What could be better than a spa treatment. Pampered serenity, holistic treatments and views of the World Heritage Greater Blue Mountains await in the calming environment of the One&Only Spa. Special offer Stay 2 nights and receive a special discount, a winter stargazing talk experience and marshmallow toasting. Book by 31 Aug 19. Valid in a Heritage Villa with sofa bed. Experience and toasting for 2 guests only. 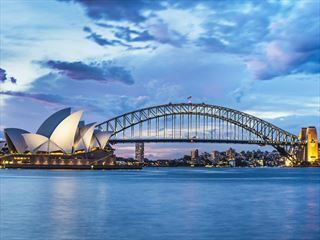 Stay between 22 Apr – 7 Jun, 10 – 30 Jun, 3 Jul – 23 Aug, 26 Aug – 1 Sep 19. Not combinable with any other offers. Amazing offer Stay 2 nights and receive a special discount and a signature wildlife and sundowners tour. Book by 29 Mar 20. Valid in a Heritage Villa with sofa bed. Wildlife and sundowners tour valid for 2 guests only. Stay between 1 Sep – 21 Dec 19, 6 – 24 Jan 20, 28 Jan – 31 Mar 20. Not combinable with any other offers.